Slow Cooker Stuffing is delicious, moist, and savory – the perfect addition to your holiday table! We love Slow Cooker recipes! Some of our favorites include Crock Pot Baked Ziti and Slow Cooker Mexican Meatloaf. One of the things I love best about a holiday feast is the stuffing. Not just any stuffing, though…I want the good stuff. That wonderful blend of hearty pieces of bread, savory vegetables, and the right blend of spices, all baked together in a flavorful broth…yum! 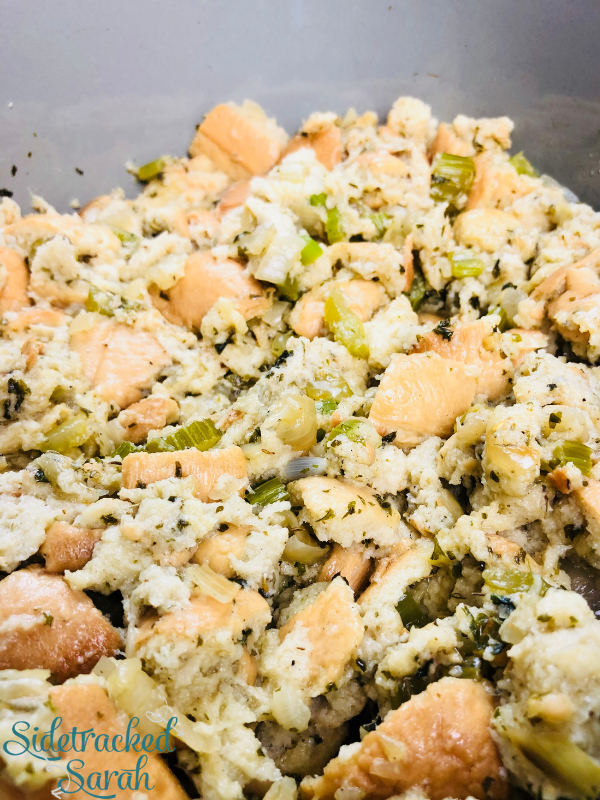 WHAT TYPE OF BREAD SHOULD I USE FOR SLOW COOKER STUFFING? I recommend using a hearty French or Italian loaf. They’re easy to come by and sturdy enough to stand up to slow cooking. 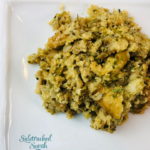 I love the way they absorb the wonderful flavors of this recipe and bring just the right texture to the stuffing! 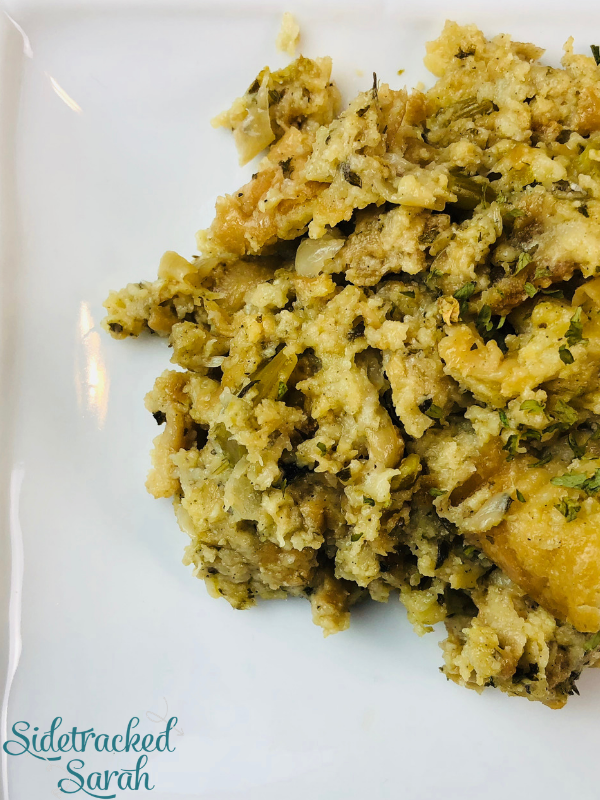 WILL SLOW COOKER STUFFING DRY OUT? When you cook stuffing in the oven, there’s always a good chance the top will dry out. That’s just the effect that the dry heat of an oven can have. In a slow cooker though, the moisture is kept in and the bread cubes absorb all of the wonderful broth and seasonings. No more dried out stuffing, and your oven is freed up as well! 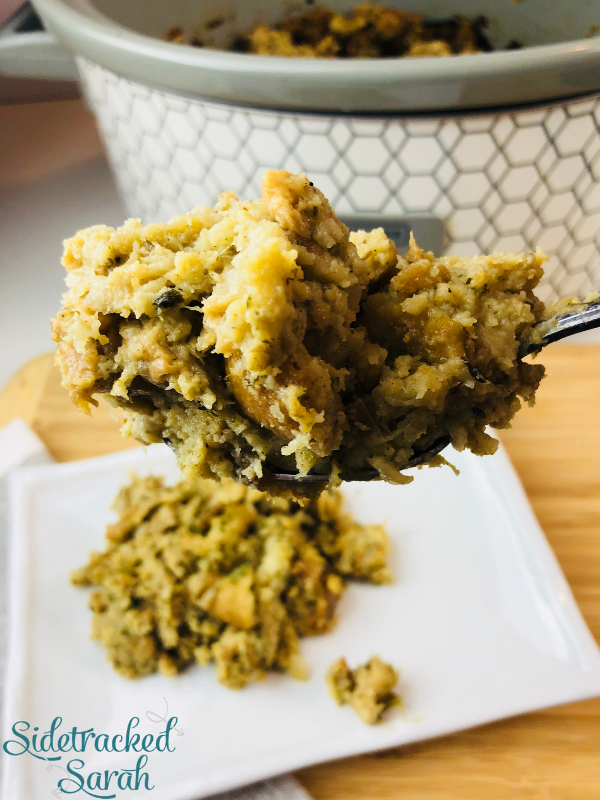 WILL SLOW COOKER STUFFING FREEZE WELL? We rarely have leftovers, as we always go back for more, but if you happen to have extra you can either keep it in the refrigerator for a few days or freeze it. If you freeze it, I would suggest tossing in a bit of broth when you reheat it. WANT MORE EASY SLOW COOKER RECIPE IDEAS? Slow Cooker Stuffing is delicious, moist, and savory - the perfect addition to your holiday table! Slice celery, chop onions. Cut bread into cubes. Cook onion, celery, and parsley in butter, stirring frequently. Spoon cooked vegetables over bread cubes in a very large mixing bowl. Season with poultry seasoning, sage, thyme, marjoram, and salt and pepper. Stir to coat evenly. Pour in enough broth to moisten, and mix in eggs. Transfer mixture to slow cooker, and cover. Cook on high for 2-3 hours or on low for 6-8 hours. If you open the slow cooker and it still seems a bit soupy, continue cooking with lid off for 30 minutes or so. This will help any extra liquid to cook off. 6 of the Most Organized Pantries You've Ever Seen!